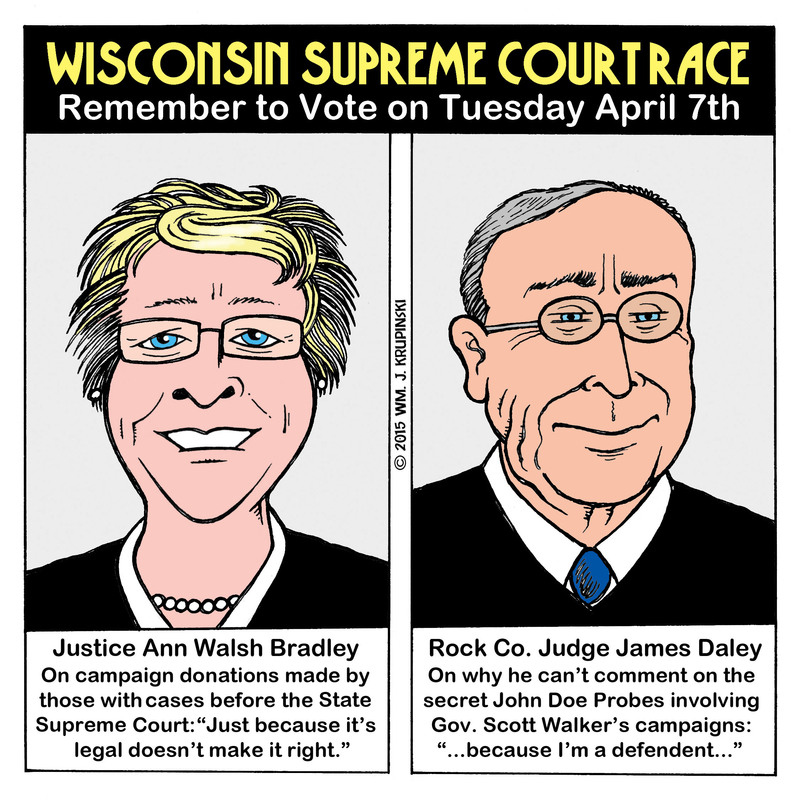 In an interview with Isthmus on March 26, Supreme Court candidates James P. Daley and incumbent Ann Walsh Bradley both admitted that, if elected, they would recuse themselves from hearing the upcoming John Doe case. Walsh would step down from hearing the case because her son is a lawyer who works for a firm that represents some of the conservatives in the case. Daley, a Rock County circuit court judge, admitted that he would step down because he is a defendant in the recent investigation into Scott Walker and his potentially illegal coordination with campaign donors. Daley is a judge for the 5th Circuit Court of Appeals, which heard the case. In earlier comments in the Cap Times from March 11 Daley states he does not believe in “dictating recusal” based on campaign donations. He also states that he believes coordination between candidates and outside money groups is illegal, the basis of the John Doe investigation into Scott Walker’s alleged coordination between his campaign and millions of dollars of donations involving Manufacturers & Commerce (WMC) and Club for Growth, among others. Daley’s daughter is also wanted on operating while intoxicated (OWI) charges on an open arrest warrant that dates back to 2008. Daley was aware that his daughter is a fugitive of the law, but chose not to disclose it earlier in the race. Also on the April 7 ballot is a referendum to change how the chief justice of the State Supreme Court is determined. For 125 years, the position of chief justice has been held by the judge who has served on the court the longest. The referendum would change the constitution to allow the chief justice to be determined by a vote of the members of the court. Many feel this is a political move on the part of State Republicans to remove Judge Shirley Abrahamson, who has been chief justice for 19 years. Pro-amendment group Vote Yes for Democracy was bankrolled by the Wisconsin Manufacturers and Commerce for $600,000 to advocate for the change. Organizations like Justice At Stake and Make Your Vote Count, nonpartisan groups that work for fair and impartial courts, oppose the referendum.